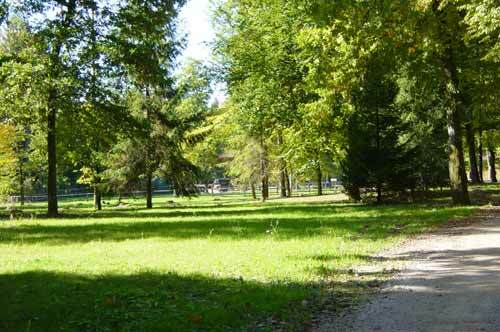 We are located between Češča vas and Prečna approximately 5 km from Novo mesto. 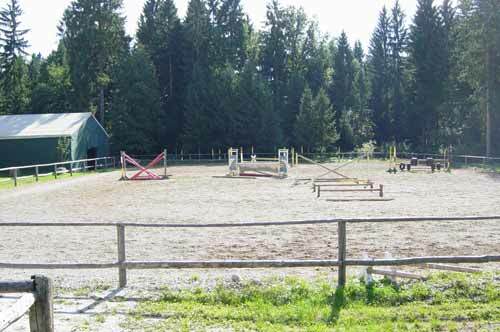 The Equestrian Sport School Centre is situated on the grounds of former military warehouses under the crowns of spruce trees which offer a pleasant shade over the paddocks and arenas where horses can move freely. 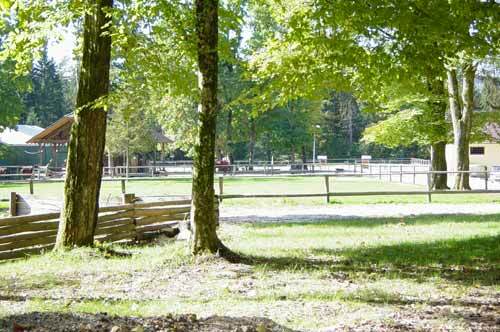 There is also a riding school under the tuition of a horseback riding instructor. 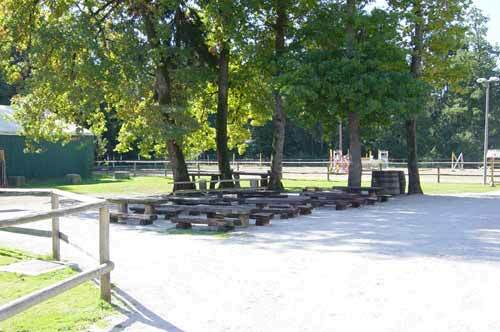 Visitors, kindergartens, schools and other groups may find many possibilities for entertainment, socialising or picnics. Horse riding or just walking can also be a great pleasure during the idyllic winter days when tree branches are loaded with snow through which the sunbeams glow. 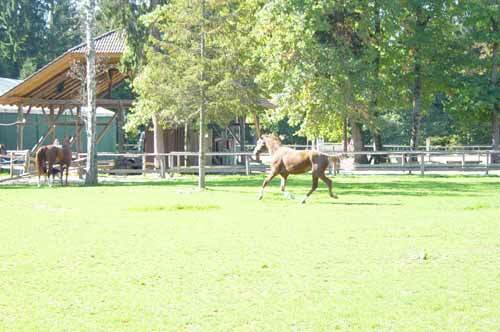 An accidental meeting with horses and equestrian activity encouraged us to become dedicated enthusiasts in this sport. We do not regret sacrificing our spare time and making substantial financial inputs. 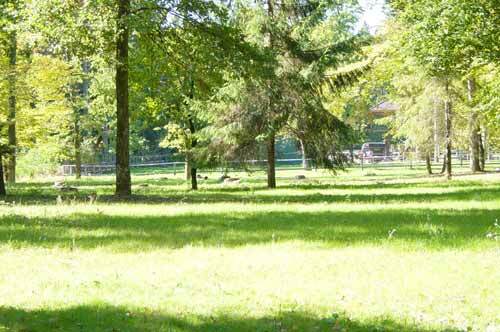 It was Jure who originally commenced horse riding when he gained his first skills at Struga near Otočec. Vlado Starič was the first man who put him into the saddle. Suzana Zevnik spent most of the time with Jure when he was a beginner. He also had a few training sessions with Samo Nipič, Maks Riossa and Manja Koren. 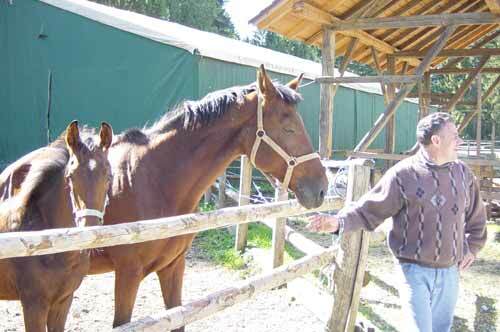 As a nine year old boy he quickly began to like horses and after his first year of horse riding he got his first mare. 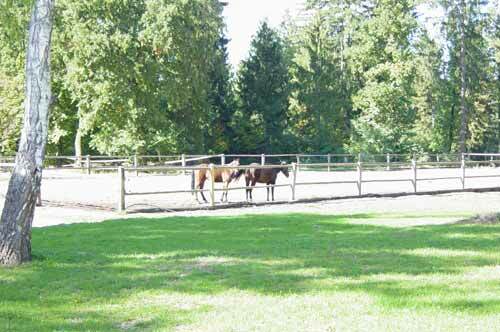 Soon after that we started thinking of our own stables and of course of founding our own equestrian centre. The beginnings of ESSC date back to October 1992. We started by constructing our first horse boxes, building the first arena and connecting the electricity, water supply and telephone to enable basic conditions for the start of our operations. Since then the appearance of the centre has changed a great deal. However, it is by no means complete even yet as we have many ideas and we wish to realise them. 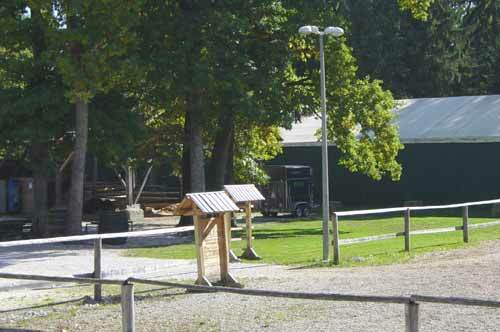 We have invested significant resources in landscaping the grounds, building additional arenas, paddocks and a tent (35x15 m) so there is the possibility to ride and train in the winter as well. 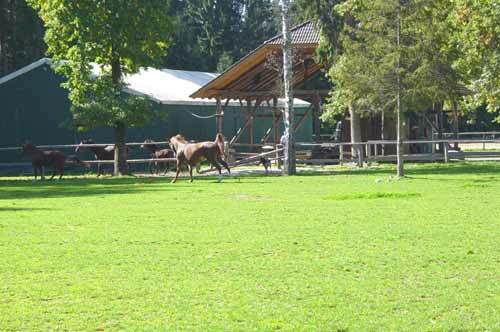 Tanja started horse riding, also. Tanja and Jure's first coach was Aleš Plečko, from Ljubljana and after that their coach was Silvana from Zagreb . When Jure began showjumping he had for four years a Hungarian coach - Zoltan Kiss. He trained Jure so well that Jure won the first place for younger juniors at the national championship and the junior cup. After that, Jure's coach was for a while Matjaž Čik, the national team selector. 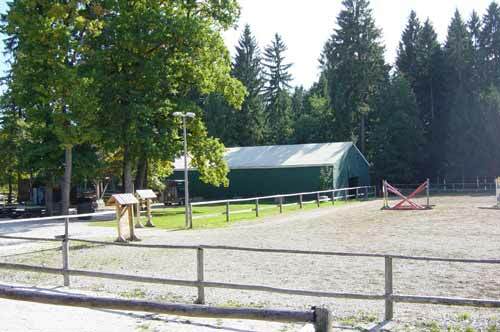 At the Equestrian Sport School Centre we also have a horse riding school. 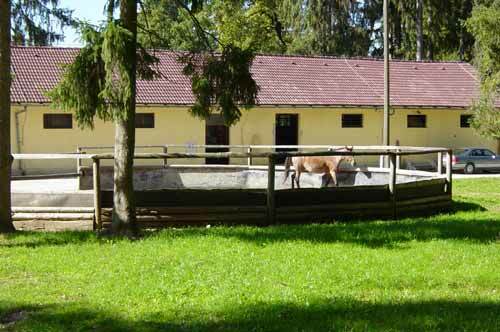 Tanja is a horse-riding instructor and she works with individuals as well as with groups from kindergartens, schools, children suffering from cerebral palsy and disabled persons from the Work and Care Centre Novo mesto. 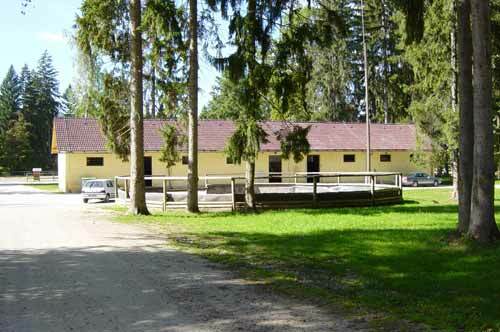 Most of the visitors are those who regularly attend the horse riding school. 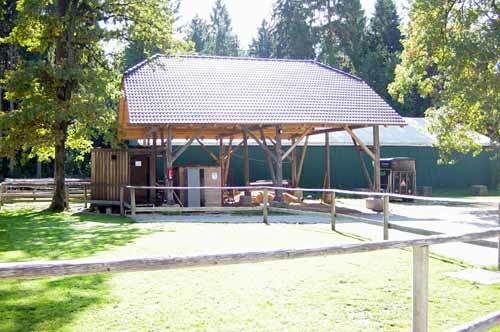 The school has six horses available - from a small pony, haflinger, icelander, up to bigger horses. The age structure of riders varies a great deal. There are children from five years upwards and you can also find some retirement-age riders. During the summer school holidays we organise supervised morning sessions for children with wide-ranging activities including the provision of meals. Riders can take examinations for the programme Rider 1 and Rider 2. For all those who want to achieve more in this sport, Jure is able to develop their skills and aptitudes. 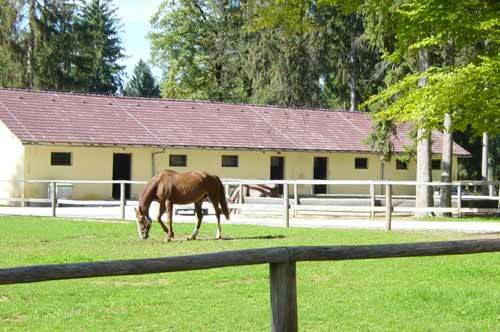 Stabling accommodation is also available for horses. 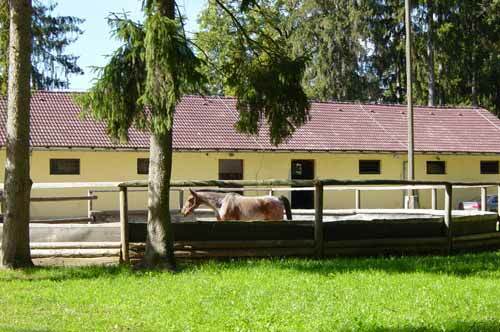 Jure has been a member of the Equestrian club Krka from Novo mesto for 10 years. Jure was in 1995 the national champion in show-jumping for younger juniors on the mare Nilus and a Cup winner for juniors. In 1996 he came second at the National Championship for younger juniors. As he did not have a suitable horse for bigger competitions in the following years, he commenced breaking in and preparing the horses himself. 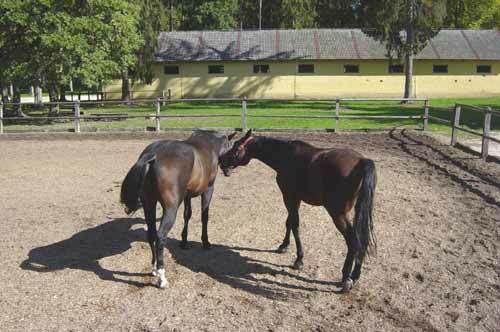 So he broke in a considerable number of Slovenian warm blooded horses and with them he achieved some good results. He gained first positions on Flying Neron on a number of occasions, and was in 1998 fifth on Prestranek at a National Championship for young five year-old horses. He came fourth in the National Championship in Gotovlje in 1999 on a Slovenian warm-blooded mare Jafa and second at the National Championship for five year-old horses. A special place in Jure's sport career belongs to the mare La Bamba which is an Austrian warm-blooded horse. It was trained from a pasture ground, hardly broken in, full of temperament yet after rwo seasons of persistent work, they were able to harmonise well with each other. 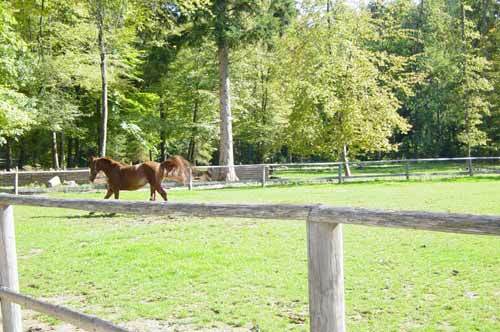 Before the arrival of La Bamba, Jure remained without a coach and it was only with a great deal of determination, persistence and love towards horses that he was able achieve some remarkable results. But show-jumping is not Jure's only virtue. When he was only 17, he prepared three riders for the competition licence in show-jumping and another four two years later. He also helped two candidates to obtain the licence for riding instructors. 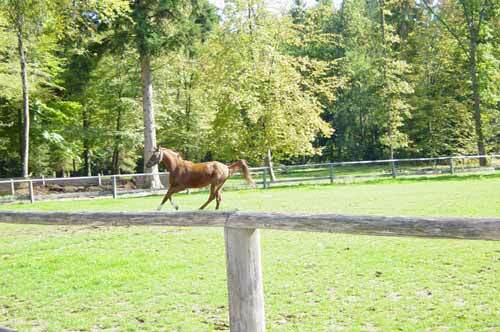 Now he trains younger riders for show-jumping. 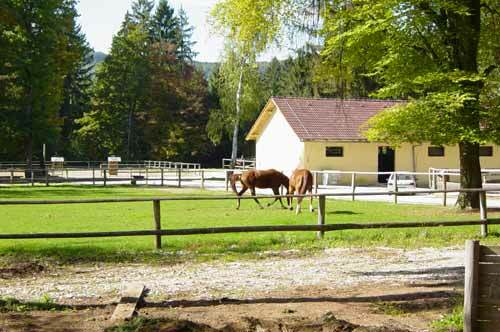 At Češča vas we started to introduce tourist riding or cross-country riding. 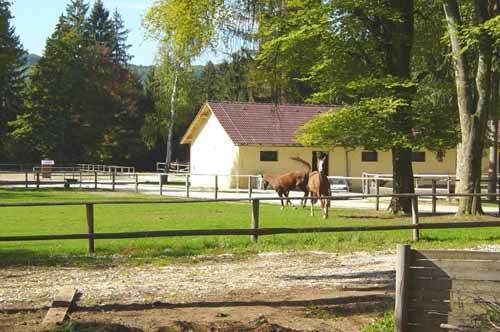 Tourist riding or cross-country riding is an idea which appeared on the basis of the demand of our visitors of our riding school and sports trainings under the professional guidance of Tanja and Jure Grubačevič. On the basis of the thirteen years of teaching and gaining experience on sports and recreation but also therapeutic riding, we have come to a conclusion that our offer cannot finish here and that the demand and expectations of our visitors exceed these limits. It was the visitors who convinced us that we; with our knowledge and attitude, are bound to make another step forward and this in the direction of tourism and widening of our offer of activities. 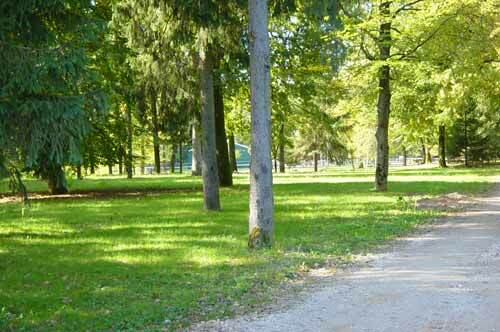 I am talking about tourist or cross-country riding. 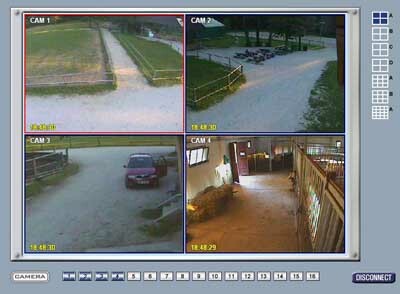 These allegations have been confirmed by the visitors of our web site by putting questions via email about the possibilities of cross-country riding at our centre. Of course. After having accepted this challenge, we had to work on this idea more precisely and after presenting the concept to some people, the enthusiasm has even grown. We are aware this is a very responsible project which demands a lot of knowledge for good and also safe implementation. 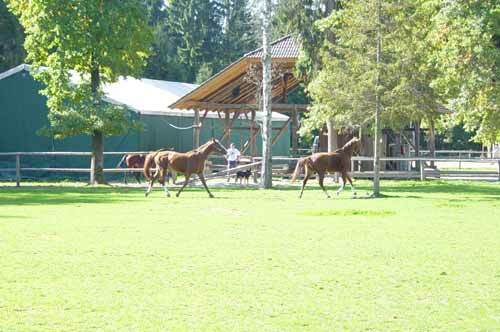 The legislation itself on this field in Slovenia demands highly skilled riders to lead the groups (they must have certain licences), but we have the intention to qalify these riders to become exquisite tourist-riding guides with perfect knowledge of history as well as tourist offer on the part of the track where they will guide the their groups of riders.